July 10, 2017 (Jacumba Hot Springs) – Adventurer Dana Law will present a travelogue about the West Coast’s national scenic trail on Tuesday, July 18 at the Jacumba Library (44605 Old Hwy 80, Jacumba Hot Springs, CA 91934 at 6 p.m. On 31 separate journeys over 13 years, Law completed all 2,650 miles of the Pacific Crest Trail, which begins in California at the Mexican border and ends at the Canadian border in Washington. July 6, 2017 (San Diego) – Thousands of electric vehicle (EV) drivers in the San Diego region will get a pleasant surprise when they open their SDG&E residential bill over the next month, as they will be receiving $200 in credit for each EV they own or lease. EV drivers help clean the air and create healthier communities by reducing greenhouse gas emissions, and they save on fueling costs, as charging an electric vehicle costs less than putting gas in the tank. FILL UP, DON'T FOUL UP THE AIR! July 1, 2017 (San Diego's East County) - Of course you know how to fill your gas tank— but are you sure you’re doing it right? Because if you’re not, you could be spilling volatile, air-polluting vapors like ethylbenzene, toluene and benzene into the air that can create smog. Read more about FILL UP, DON'T FOUL UP THE AIR! June 26, 2017 (San Diego) – State Senator Ben Hueso (D-San Diego) has introduced Senate Bill 507 to help protect the Tijuana River Valley in the wake of repeated severe sewage spills from Mexico, including a spill in February that dumped an estimated 28 to 100 million gallons of raw sewage into the valley. June 13, 2017 (San Diego) - At the May 24, 2017 V.I.P. (Very Important Planet) Reception held at the City of San Diego Environmental Services Department, San Diego EarthWorks recognized EDCO with the E.A.R.T.H. (Environmental Action and Restoration That Helps) Award for EarthFair efforts. There to accept the award on EDCO’s behalf was John Snyder, EDCO’s Vice President and Chief Administrative Officer, and Elmer Heap, EDCO’s Division Manager. June 7, 2017 (La Mesa) -- Tonight’s meeting of the La Mesa Foothills Democratic Club will feature a veritable who’s who of leading San Diego experts in the political ramifications of executive orders dealing with our economy and the environment. Social hour starts at 6:30 with the program at 7 p.m. at the La Mesa Community Center. Speakers included renowned climate scientist Jeff Severinghaus, Professor of Geosciences at Scripps Institution of Oceanography, who has voiced concern at the drastic measures taken by the Trump Administration in rolling back recently enacted advances to combat global warming. June 2, 2017 (San Diego) -- The Center for Biological Diversity has filed a formal notice of intent to sue the Department of Homeland Security and U.S. Customs and Border Protection over impacts to endangered species and critical habitat from building up to 20 border-wall “prototype” designs in San Diego County. 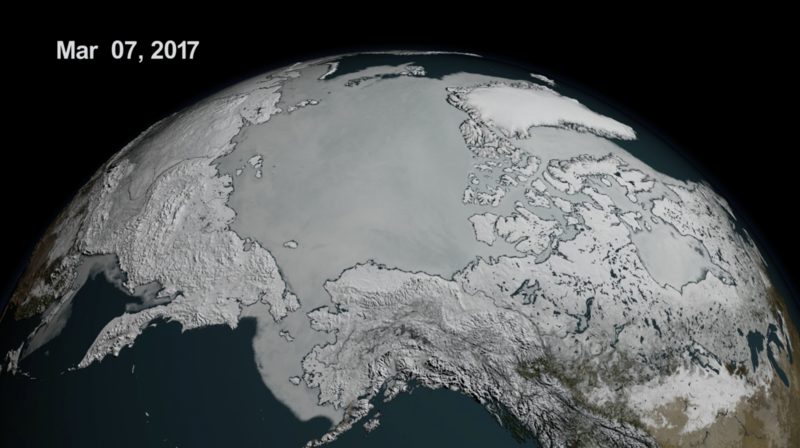 Photo: NASA satellite: Arctic ice reached an all-time record low in March, due to record temperatures. June 2, 2017 (San Diego)—President Donald Trump’s announcement yesterday to withdraw the United States from the Paris Climate Accord means the U.S. joins Syrian dictator Bashar Assad as the only other world leader who does not believe climate change is a serious threat to the planet. Every nation on earth signed the Paris agreement calling for aggressive action to combat climate change, except for Syria and Nicaragua, but Nicaragua wanted even stronger actions to protect planet Earth. June 1, 2017 (San Diego's East County) - California Gov. Jerry Brown vowed Thursday the state would continue its fight against climate change despite President Trump’s “misguided and insane” decision to leave the Paris Climate Agreement. May 31, 2017 (San Diego) — Congressman Duncan Hunter (R-Alpine) sent a letter May 9th to Secretary of State Rex Tillerson and to Scott Pruitt, administrator of the Environmental Protection Agency, asking them to take action in the wake of a major sewage spill into the Tijuana River Valley in the U.S. from Mexico earlier this year. Hunter cites concerns not only for environmental and public health, but also negative impacts felt by U.S. Border Patrol agents and Navy Seal teams performing responsibilities in the area daily. Editor’s note: The Five Peaks Challenge encourages hikers to ascend five peaks in Mission Trails Regional Park at their own pace. Greg Dunne and his team were the first to achieve this in a single day. To follow up on that feat, they’ve now hiked every trail on and around Cowles Mountain--all in one day. May 21, 2017 (San Diego) -- Today we took an epic hike up Cowles Mountain and the surrounding trails that has never been done before, all in one day! I call this hike “Cowles Tour 13.2”. My friend David Hart and I undertook this hike on Friday, May 19, 2017. My daughter would ask – WHY? Well, my answer is not because it’s there, but because it’s in my backyard, fun and nobody thought to do it. May 21, 2017 (Ramona) – You’re invited to “Living with Coyotes,” a talk by Ali Crumpacker, director of the Wildlife Center. The presentation will be held Sunday, May 28th at 5 p.m. at the Ramona Ranch Winery, 23578 Highway 78 in Ramona. May 20, 2017 (San Diego) - GRID Alternatives entered San Diego eight years ago, with a solar installation in El Cajon. Since then, the non-profit has put up a total of 824 systems throughout the county. This Saturday, they return to the same El Cajon neighbourhood for GRID Alternatives San Diego’s SummerSolarthon. May 18, 2017 (San Diego) - Celebrate Military Appreciation Month with two patriotic events at County parks. First, gather up family and friends for a Salute to Military Families at Lake Morena on Saturday, May 20. The festivities are hosted by County Parks in partnership with VALOR, the County’s employee resource group for veterans. May 12, 2017 (La Mesa) -- The community is invited to attend the ribbon cutting celebration for the opening of the first phase of the Collier Park Improvement Project on May 25 at 4:30 pm at 4401 Palm Avenue in La Mesa. May 12, 2017 (La Mesa) - Helix Water District has named Chandrika “Dusty” Patel-Lynch of La Mesa as this year’s winner of its WaterSmart Landscape Contest. The annual contest recognizes outstanding water-wise residential landscapes which are judged on overall attractiveness, appropriate plant selection and maintenance, design and efficient irrigation methods. May 12, 2017 (San Diego) - The County will host its 18th annual lawn mower exchange this Saturday, May 13th at Qualcomm Stadium. Doors open at 6 a.m.; the event takes place from 8 a.m. to 12 noon. County Supervisor Ron Roberts, pollution control officers, recyclers, Electric Vehicle display sponsored by SDG&E and hundreds of San Diegans lined up with gasoline powered lawnmowers and gardening equipment to be exchanged for new rechargeable mode equipment. May 8, 2017 (Suunyvale, Calif.) - Water systems in California have the nation's ninth-worst record for violations of the Safe Drinking Water Act, according to a new report from the Natural Resources Defense Council (NRDC). May 3, 2017 (San Diego) -- The Center for Biological Diversity, a national nonprofit conservation organization, today filed a Freedom of Information Act request seeking public records on whether planned prototypes for President Trump’s border wall in Southern California comply with laws meant to protect wildlife, people and wild places. Photo: Boole Tree in Sequoia National Monument is the sixth largest tree in the world, but could be lost under Trump’s order. April 30, 2017 (San Diego) -- Ten of California's national monuments could be reduced in size or even eliminated as part of a review of all such properties, in an executive order signed last week by President Trump. April 29, 2017 (San Diego) – The Santa Barbara oil spill of 1969 was the worst environmental disaster in U.S. history at the time. Three million gallons of crude oil contaminated the ocean and beaches with thick, black goo. Oil bubbled from the blown well and from cracks in the sea bed, killing countless sea birds, seals and other marine life. The last remaining oil derrick off California's coast is slated to be decommissioned, Public News Service reported last week. But now an executive order by President Donald Trump could result in offshore oil wells again pumping in the waters off California. April 29, 2017 (San Diego) -- Last Saturday, April the 22nd. 15,000 people joined a March for Science in San Diego to protest anti-science, mostly anti-climate science, policies of the new Trump administration. (Please see our report: http://eastcountymagazine.org/print/24751) Today, by contrast, was everybody else's turn to participate in "The People's Climate March." According to San Diego Police estimates, 4,000 to 5,000 people took up this Saturday's cause, or about a third as many marched last weekend when there were also Earth Day activities in the vicinity.